A dozen of the finest imported roses, hand tied with tea leaves and accented with Cymbidium orchids for a romantic touch, accompanied with a box of Fraiche’s signature chocolates. 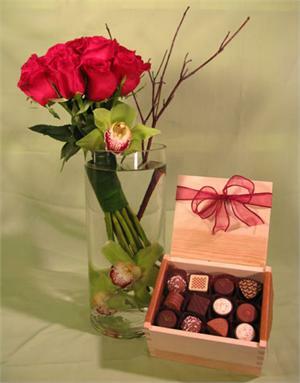 We offer dozen roses arrangements, unique rose arrangement, and roses floral arrangement for any occasion. We promptly deliver your dozen red roses or dozen red rose vase to your home or office in Beverly Hills, West Hollywood, Santa Monica, and greater Los Angeles area.